The DZero collaboration at Fermilab on Thursday announced the discovery of a new particle whose quark content appears to be qualitatively different from normal. An ordinary meson is composed of a quark and an antiquark, whereas an ordinary baryon is made from three quarks. Physicists have long conjectured that exotic particles containing an additional quark-antiquark pair could exist, and a handful of candidates have been seen. Such particles, called tetraquarks, or their close relatives, the pentaquarks, would be exotic states forming a new particle species paralleling the ordinary mesons and baryons. DZero searched for new exotic states decaying into a Bs meson and a pi meson. Both of these are well-known mesons, which travel finite distances before decaying via the weak nuclear interaction. The Bs meson is composed of a quark and an antiquark of bottom and strange types, and the pi meson has an up and down quark and antiquark. 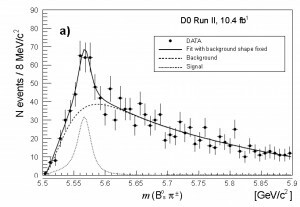 The study, using the full data set acquired at the Tevatron collider from 2002 to 2011 totaling 10 inverse femtobarns, identified the Bs meson through its decay into intermediate J/psi and phi mesons, which subsequently decayed into a pair of oppositely charged muons and a pair of oppositely charged K mesons respectively (see diagram). 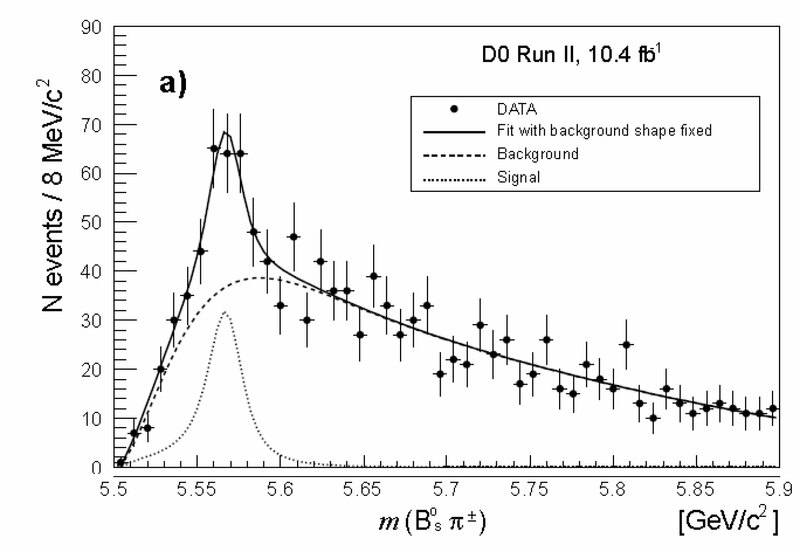 This plot shows the distribution of the mass of the Bs pi system. The dashed line shows the expected distribution for the background processes and the dotted line shows the results of the fit for the signal peak. The excess corresponding to the X(5568) has 133 ± 31 events. The plot of the mass distribution of the Bs and pi meson combination (see the mass plot) shows an excess of 133 ± 31 events over the estimated background, with a mass of 5,568 MeV. The mass peak of the new state, called X(5568), is relatively broad (22 MeV) indicating that the particle decays via the strong interaction. The probability that previously known processes could have fluctuated to give a signal as strong as that seen is only 1 in about 6 million (5.1 standard deviation significance), after taking into account the estimated uncertainties in the analysis and the possibility that such a fluctuation could have occurred anywhere within the search window. The fact that the new X(5568) particle decays via the strong interaction into a Bs and pi mesons tells us that it contains four distinct flavors of quarks and antiquarks – bottom, strange, up and down. Several other previously observed particles are good candidates to be tetraquark or pentaquark states, but all of these have a quark and antiquark of the same flavor, and thus their character as an exotic particle is less certain. Scientists are investigating the internal structure of X(5568). Its four quarks could be configured as on the left – a tetraquark. It could also be configured as two pairs in a so-called molecular state, similar to a molecule of hydrogen, in which the two hydrogen atoms circle each other. 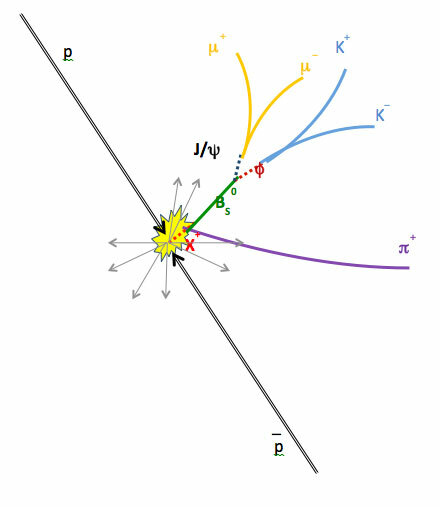 The detailed internal structure of the new X(5568) particle, or the other tetraquark candidates, is not yet understood; they could be a relatively tightly bound combination of all four quarks and antiquarks, or they could be a structures in which two tightly bound quark-antiquark states revolve around each other (see figure). 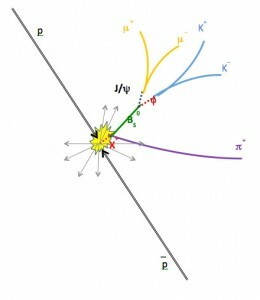 Measuring the properties of the new X(5568) particle and other tetraquark candidates – their masses, lifetimes, spins and parities, as well as the probabilities for them to decay into various final particle combinations – will give valuable new information about how the strong force binds quarks (and antiquarks) into observable particles. Dmitri Denisov and Paul Grannis are the co-spokespersons for the DZero experiment.